While normally, I'm all about chocolate desserts (the more chocolate, the better), I have always loved strawberry shortcake! When I was a kid, my mom would make us her version of strawberry shortcake: a slice of Sara Lee pound cake, topped with vanilla pudding and sliced strawberries! Mm! It was always a nice treat...one we were occasionally allowed to enjoy for breakfast! I was 19 before I tried the more traditional strawberry shortcake with the layers of cake, whipped cream and strawberries...and while I do love the traditional version, I love my momma's version better! Friday (June 14th) was National Strawberry Shortcake Day! Who thinks up these things? Whoever it is, I want to give a BIG thank you! I love strawberry shortcake and if the calendar tells me I should celebrate, then who am I to disobey? I didn't have a frozen pound cake and I didn't feel like a trip to the store, so I improvised! 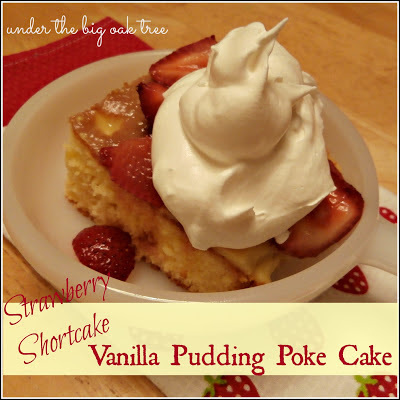 I combined the concept of this Pudding Poke Cake with the flavors of Mom's strawberry shortcake...I was not disappointed with the results! Yellow cake prepared and cooled in a 9x13 glass dish. Poke holes in cooled cake with the end of a wooden spoon. Pour the pudding evenly over cake. Chill for 2 (or more) hours, covered. Stir together sliced strawberries with sugar, cover and refrigerate. Slice chilled cake into 12 servings. Top with desired amount of strawberries, whipped topping. I had about a pint of strawberries...next time, I'd probably use 2 pints of strawberries to be sure to have enough for the entire cake! I didn't measure the berry/sugar step of this dessert. I just sprinkled a little sugar in, stirred...added a little more sugar and stirred. I can't wait to have an occasion to make this cake again! Great for a potluck or a barbecue. A variety of mixed berries would be delicious, too! According to this list of National Food Days, today is National Fudge Day! Sadly, I don't have the ingredients to make our favorite fudge recipe today, I'll just have to settle for sharing the link with y'all today!